Can you tell me what “stationery pad” does? It’s that little checkbox in a Finder’s Get Info window. I’ve always been curious, but I can’t figure it out. The Stationery Pad feature has been around for years. Helpful though it can be, very few people use it. And that’s too bad. It’s a way of creating a template document. 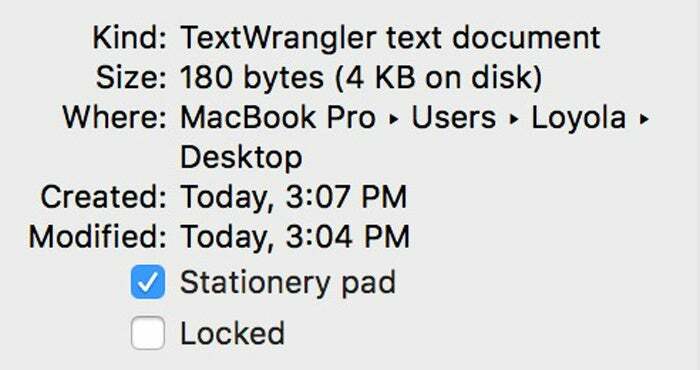 For example, create a blank TextEdit document, save it to the desktop, select it, press Command-I, and enable the Stationery Pad option. Double-click on that document and you generate a copy of it, complete with all of the original document’s content. The original file remains untouched. You can do it with any file type but, of course, it’s not useful for all files. For example, it doesn’t do you a lot of good to save most image and movie files as stationery pads.